Pirates War: The Dice King sees players purchase islands and battle their opponents as they work to discover lost pirate treasures. 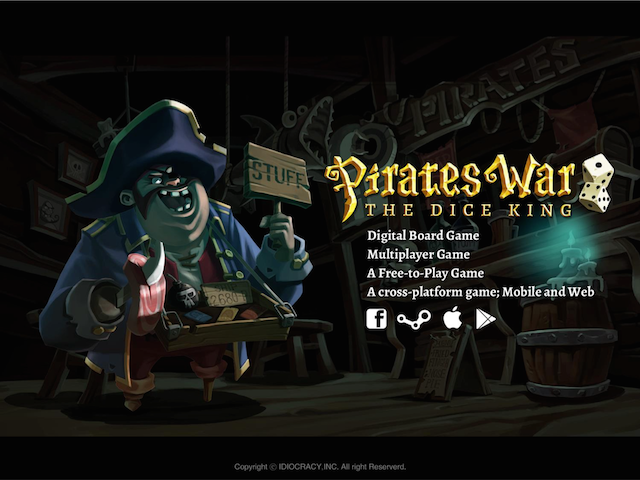 Korean game developer Idiocracy has launched a Kickstarter for its upcoming cross-platform mobile, PC and Facebook digital board game, Pirates War: The Dice King. The multiplayer property building game is similar to Monopoly, and will take players to the Islands of the Tiakoke on a quest to find the lost treasures of famous pirate captain Jake Morgan. In the game, players create a captain and ship that stay with them between games. During each four-player game, players will roll dice to move between islands, and can purchase unclaimed islands with their existing treasure. When players land on another gamer’s territory, they have the option of paying a toll or heading into battle. If the visiting player wins the battle, they can take over the land for themselves. In addition to standard property islands, the game offers special islands with negative and positive effects. Landing on the Kraken island, for instance, will cause the player to lose two turns (unless they roll double on the dice), while the Navy Base sees gamers enter battle against the authorities. If gamers lose this battle, they’ll also lose a crew member until the navy is eventually defeated. More positive islands may offer instant treasure boosts, or allow players to warp to any chosen space on the board, as examples. While similar games reset a player’s stats in between games, in Pirates War, players will level up their captain and ship as they continue to play. This will make players stronger over time, and will also ‘diversify’ future games. Each game is expected to last 10 to 15 minutes. The Pirate Wars: The Dice King Kickstarter campaign is seeking $40,000 in funding, and has earned $2,500 as of this writing, with 23 days remaining. It’s worth noting, the game will still release even if the campaign is unsuccessful.